And then I took a half hour to screw them into the back of our closet door. I still need to address the brassy hinges and doorknob. Le sigh. I was pretty psyched to have more ways to be lazy, so I immediately hung up all the 'painting clothes' and other items that we wear several times before washing - finally freeing up our upstairs doorknobs. I'm honestly not sure if I've done a good or bad thing! You did an AWESOME thing. And pat yourself on the back for having the sense to buy a house w/ a closet big enough that you can have a door on it AND STAND ON THE CLOSET SIDE to take a picture. That's a good thing if ever I heard of one. That was DEFINITELY worth mentioning. I HATE hanging up clothes too, and I thought I was the only one! Although, unlike you, I tend to leave my clothes in piles in our hallway. It drives my boyfriend absolutely crazy. Ha! I'm like this too with my clothes. Great idea, one definitely worth posting about! Definitely a good thing. I need to do this in my daughter's room. Anything that gets her clothes up off the floor HAS to be an improvement. This would be perfect for me.. I was just discussing this with my husband this morning. He was complaining that I tend to put my PJs at the foot of the bed... 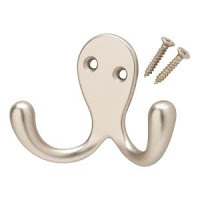 These hooks would be perfect for PJs and yes, painting clothes! Thanks! It looks better than clothes draped over a vacuum :) Also, your closet makes me pea green with envy, ma'am. I need to figure out where to add hooks like that, because I definitely have things hanging (or worse, piled!) everywhere! Door knobs, the mirror, the hamper (why not IN the hamper?) etc etc. I am shamefaced. Okay, I have to know what your "other" clothes are. I've been told this is disgusting, but am I the only one who will go for a run in the same clothes more than once? If not I'll always have a mountain of running clothes to wash! @ Amanda, but the real question is...did you wash or save the clothes from your Drrrty Dash? And Sara your thing was good and bad. I bought that awesome Ikea moose hook (http://stylefyles.tumblr.com/post/469199270/moosic-to-my-ears) because the boyf. insisted he needed a "backpack hanger." Well, a series of backpacks made their way off the floor, and things were clear for awhile, but somehow the backpacks were replaced by more bags, and clothes and well...you get the idea. Too much stuff. Dude, I totally wear my running pants again and again! I will sometimes Febreze them before hanging up, but don't count on it. I'm going to get them all gross again, anyway! Usually workout tops I will wash every time because they are small in the laundry, and I hate pulling a dirty shirt over my head. Oh, and sports bras will get hung up and worn again. I don't know why I'm ok with that, but not the shirts? Weirdo!!! I'm the same way. I hate all things laundry and I haaaate hanging things up. [Okay maybe not hate it but I have a bad habit of not doing it]. The hooks are an awesome idea! At least you hung your clothes on things. I have the abd habit of laying them on the soda at the foot of the bed. And then they pile and pile up. So we don't actually use the sofa for sitting. Just glorified clothes storage. Very useful. Maybe we need to invest in some hooks too! That's one of those things that makes you wonder what took you so long to do!!?? I love easy fixes like that. TOTALLY WORTH POSTING ABOUT. Because I happen to notice the light fixture. It looks like it might be pretty cool. Haha I just saw Mary's question to me. The answer is yes- I totally washed EVERYTHING I wore in the Dash (everything) and will wear it again! This was one case when I did NOT hang them up to wear again. And it's good to hear that I'm not the only one who wears workout clothes more than once! Sara that is so funny about the shirt/bra discrepancy. Aaaahahaha.